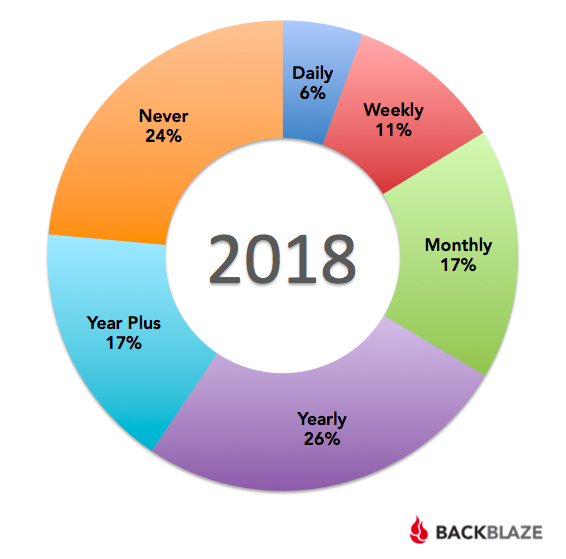 According to a study from the Harris Poll commissioned by BackBlaze.com, 24% of computer users never back up their data. Hopefully, none of this percentage are genealogists. What is more disturbing, only about 6% of the computer users back up their data on a daily basis. Personally, I have two complete backups daily; one to Backblaze and another to an external hard drive using TimeMachine. During the past few years, I have had to restore my entire system due to a major internal hard drive failure. For me, this clearly shows the need for consistency in backing up my data. There are a number of online data storage companies that provide backup services. These include offerings from Apple, Microsoft, and Amazon, but these services are not comprehensive, i.e. they do not include your operating system and all your programs. When my main hard drive crashed, I used the TimeMachine backup to restore my files, but even with TimeMachine, the process took many hours of time to load all the information and return to the point when the drive went bad. I cannot imagine trying to restore all the Terabytes of information I have without a comprehensive backup. At the very least, go out an buy an external drive and back up your important files. The cost of a 8 Terabyte hard drive has dropped to about $149 on Amazon.com. How many hours of work would you have to do if your system crashed, was destroyed in a catastrophe, or was stolen? If you need help getting started with backing up your data, there are many other genealogists who, I am sure, would be willing to help. Get busy today and save yourself some major grief. What do I need to know to Attend RootsTech 2019? Where are we with social networking?